Los Angeles International Airport (LAX) is one of the biggest, busiest airports in the country. In one year alone, it handles more than 75 million passengers passing through. With so many feet going through LAX, it’s not hard to imagine the hassle of navigating your way out of the airport to get home or to your accommodation. Not to mention the anxiety of driving through the bustling streets of LA. This is where private airport transportation can ease the stress of traveling to and from the airport. When you reserve a private car service, you can rest assured every effort is made to ensure you enjoy a safe and reliable ride. 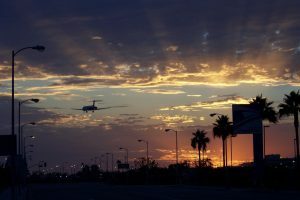 Whether you’re a busy business professional who frequently travels, or you’re arriving for a getaway in Santa Barbara or the Santa Ynez Valley, you don’t want to spend a second longer than you have to at LAX. Getting out of the airport and to your hotel can be a hassle, especially if you’re staying in a major city. While many people think that a shuttle or taxi service is the answer, they’re often disappointed with the quality of service. Comfort and luxury – shuttle buses and cabs are not known for luxury. A private car service provides the comfort and luxury you deserve when you arrive at LAX. Traveling in style not only leaves a lasting impression on your colleagues, clients or friends, but it ensures you enjoy a safe and comfortable ride to your destination. Privacy – a shuttle bus is filled with people and can get rather uncomfortable. With private airport transportation, you receive complete privacy for you and those you travel with. So, whether you want to make a call, do a little work or just start unwinding, you are free to do so. Whether you’re arriving for a delectable wine weekend or a spot of business, make sure you get from LAX to your accommodation in style. Book your private door-to-door airport transportation today with Silk Road Transportation and let us worry about the traffic!